Till some time back, malware creators often targeted Windows operating system directly. Now Windows has been quite successful in protecting their users by circulating security patches in system updates. Windows has become more secure than ever, hence malware creators have shifted their attention to Windows applications. They are inventing newer and stealthier methods to infect Windows applications and then ultimately the Windows computer. Hence, it’s high time to keep Windows applications up-to-date. We know that updating each and every Windows software can be a cumbersome task. 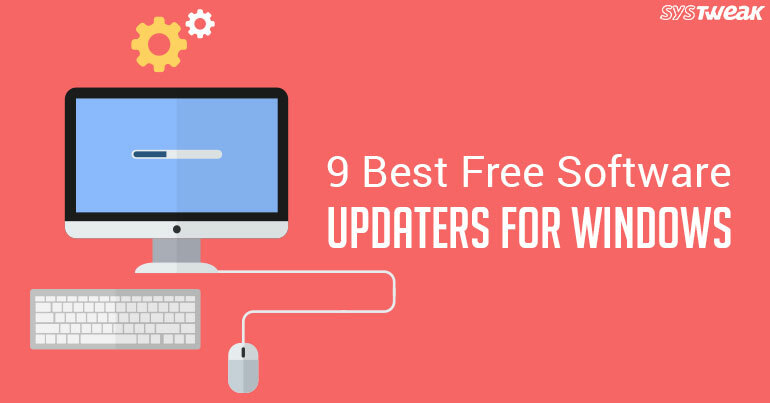 Thus, we have prepared a list of the best free software updaters for your Windows computer. Read on to keep your applications up-to-date and safe from threats. Heimdal is an amazing software updater that timely downloads and installs software patches without any hassles. Your security-critical software stays updated always with the help of Heimdal free software updater. The software works in an ‘auto-pilot’ mode where all programs that are compatible are updated automatically. You can even customize updater settings like you can choose which programs you want to update. You can modify the default time for monitoring updates i.e. two hours. You can change it according to your preference. Heimdal recommends various programs and offers a smooth UI that allows you to perform actions with a single click. There are some extra features like website blocking and malware detection that are available in Heimdal’s pro version. However if you are looking for a software updater, the Heimdal free software updater is all you can ask for. Click here to download Heimdal for free. It was earlier known as Update Checker. FileHippo App Manager is an easy to use software that searches for outdated software on your PC and shows the scanned results on your web browser. You can find links of the latest updates of the outdated software on your webpage. The link will take you to FileHippo’s repository to download various updates. FileHippo App Manager displays old, new and beta versions updates. However, results can be customized (for example, you can hide beta updates). Like other updaters, you can exclude programs from the scan. FileHippo App Manager is a light-weight program and its 1 MB application file takes no more than few seconds to install. FileHippo App Manager is compatible any Windows operating system version. Click here to download FIleHippo App Manager. Note:- Windows Server 2003 is supported by FileHippo App Manager. Another great software updater in the list that’s free and entirely portable. Patch My PC updates your software without your intervention to click anything during the process. With Patch My PC, you can easily distinguish between outdated and updated software. Green patches are provided to software that are up-to-date while red patches indicate the outdated ones. You can decide whether you want to update a software or not. You can also let Patch My PC do it automatically. There are optional settings that can be altered such as enabling forced program shutdowns before updating them, enabling beta updates, disabling silent updates and many more. You can also use Patch My PC to uninstall programs. The software doesn’t have a great user interface but its other features outshine its disadvantage. Patch My PC is quick and can be executed from a USB flash drive. The software works smoothly with all Windows versions like Windows 10/8/8.1/7/XP/Vista. Click here to download Patch My PC Updater. PC App Store automatically finds outdated software and asks you to update it when required. The software is free and it has a great user interface that manages downloads and installs software updates. Therefore, software update gets downloaded without opening a web browser. In PC App Store, you can know which updates are being installed on your system. Hence, you can exclude any particular version of update if you want and PC App Store will exclude the particular update in the list of updates to be downloaded. You can use PC App Store as a program uninstaller. Moreover, it works like an app store and contains various apps and games that you can download via PC App Store. The software is worth trying! Click here to download PC App Store. OUTDATEFighter is a free software updater that shields your PC against outdated software. A single click downloads and installs necessary updates for your software. Additionally, you can decide which software you want to update by checking software in the list via OUTDATEFighter. OUTDATEFighter scans files before they get downloaded on your computer. Thus, your computer remains secure from infections during downloads. It notifies if a software is outdated. OUTDATEFighter further provides links of different updates, therefore, you never need to find necessary updates on the web. The tool also includes an uninstaller utility service. OUTDATEFighter supports all Windows versions as well as Windows Server 2003 and 2008. Click here to download the software. Carambis Software Updater works like FileHippo App Manager as it shows updates to be downloaded on your web browser rather than displaying direct downloads. You need to click on the link to download the software update on your computer. The result page will show the name of the update, its version and download size. So, you can now decide whether you want to download the update or not. You can schedule software updates on Carambis Software Updater. Carambis Software Updater support Windows 10, Windows 8.1/8, Windows 7/Vista/XP. Click here to download Carambis Software Updater. Update Notifier is one of the best software updater programs available today. The program check software in the background and notifies if updates are needed. You can schedule checks according to your preference, for example, weekly or every 3 days. Update Notifier does not support direct download and you need to download updates via web browser. Update Notifier recommends websites to download software updates that are original, secure and up-to-date. You can even scan portable programs that are not present in the program files location. Update Notifier also has a feature where you can get notifications about new software updates via email. All you need is to register with Update Notifier. You can use Update Notifier as a portable program. You can achieve that by selecting the portable mode during software installation. Update Notifier supports Windows 10/ 8.1/ 87/Vista/XP. Click here to download the free software updater. SUMo is amazing at finding updates for outdated software. The program is user-friendly and detects maximum number of outdated programs than any other software updater. SUMo is portable and you can find different versions of updates with the help of the software. Though, the tool is very powerful, it does not provide the link to download the software. Finding and installing updates is a manual process when done through SUMo. on the contrary, SUMo will provide links of popular software download websites softonic, softpedia and many more. Therefore, SUMo is great when it comes to finding outdated software but lacks in complete assistance throughout the process. Click here to download SUMo. Updating software is quite a cakewalk with Avira Free Software Updater. The app lists all your outdated software on the screen with a single click. Avira Free Software Updater is quick and takes the help of Internet browsers to download updates. Avira Free Software Updater gives you the freedom to click links you wish to download and update your software. As it’s a free version, it has limited features included in it. If you want to use the software to the fullest, you need to buy the full version. You can upgrade to the full version by clicking the link beside ‘Update’ button in the tool. Note: – While installing Avira Free Software Updater, the wizard will ask whether you want to install Avira antivirus or not. You can avoid it if you want, especially if you already have an antivirus installed on your PC. Click here to download Avira Free Software Updater. These tools are amazing and absolutely free. We hope that they deliver what you desire. Share your experience with us in the comments section below. To get more helpful articles in your inbox, subscribe now!